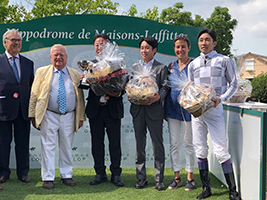 Japan’s Geniale went wire-to-wire in the Grade 3 Prix Messidor held at Maisons-Laffitte Racecourse in France on Sunday, July 22. Ridden by Yutaka Take and trained by Mikio Matsunaga, Geniale hit the front out of the gates and never surrendered the lead in the 1,600-meter, straight course race. Geniale, a 4-year-old horse by Deep Impact out of Sarafina, entered Sunday’s race with a 2-for-7 career record, with wins coming at 1,400m and 1,600m. Running in the Kieffers Co. Ltd. colours, Geniale collected EUR40,000 for his triumph on Sunday. 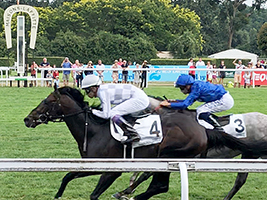 The same owner-trainer-jockey combination appeared again in the race immediately afterward, with 5-year-old mare L’Arc competing in the Prix de la Pepiniere, a Listed race over 2,100m. However, L’Arc was not able to duplicate Geniale’s success, finishing eighth in a 10-horse field.